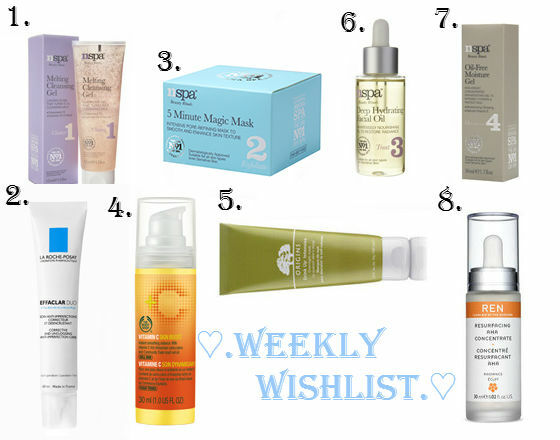 GotToLove♥: Weekly Wishlist #4- Skincare special. Weekly Wishlist #4- Skincare special. I have oily to combination skin, for make-up I want a medium to full coverage and I would say I wear full make-up almost everyday. So I need to keep good care if my skin and make sure I'm using the right products for it. I do love some of the products I have like, Soap and Glory- Peaches and Clean Cleansing Milk, Garnier- Intensive Charcoal Scrub and Clearasil- Vitamins and Extracts Mask, but I just felt I need to go the extra mile and get some products that go well together and give a deeper clean. So I did some research and found some products that address some of the issues with my skin, with each product I shall tell you what they aim to do. 1/ Nspa Melting Cleansing Gel. 2/La Roche Posay Effaclar Gel. 3/Nspa 5 Minute Magic Mask 4/ Bodyshop Vitamin C Skin Reviver. 5/ Origins Drink-up Intensive Overnight Mask. 6/ Nspa Deep Hydrating Facial Oil. 7/ Nspa Oil-Free Moisture Gel. 8/ REN Resurfacing Aha Concentrate. 1. This is the first part of the four step beauty ritual, the fist part is to cleanse. I chose this as I loved the idea of it, it transforms on your face from a gel to a milk with the addition of water. It contains Grapeseed Oil to dissolve make-up and impurities and the main thing that drew me to it is it helps to improve radiance which is a real need for me. 2. This is by far my most wanted skincare product and I'm hoping to get it real soon! The reviews for this product are just brilliant, they claim to get rid of spots, acne scars, blackheads and under the skin spots too. Anything you can think of this pretty much does it all! I really hope this lives up to my expectations as it has been every hyped up in my head and in the general blogging world. 3. Next is the part 2 for the Nspa beauty rituals and I am just becoming addicted to masks, which is why I chose this for the Exfoliate step. I loved the sound of the ingredients, avocado and apricots, surely this is a recipe for perfection. Also I love a clay mask as supposed to a mask like the Clearasil one I mentioned earlier. 4. I love this product, I already have it but I am really running low so I thought I'd add this onto my wish list. I haven't tried many primers before but that's because this one just fits the bill so well, my make-up glides on smoother and stays on longer. On the odd day when I forget to apply this I notice straight away that my foundation is really not looking great and when you can see the difference like that you know you have a great product. 5. As I said I am addicted to masks so of course I need one for the whole of the night-time. Even though I have quite oily skin, you still need to give it enough moisture and fight the oil in other ways and I am hoping this mask is the perfect one to give my skin a well needed bit of moisture. It contains Japanese Seaweed which helps prevent future dehydration and also fight against premature ageing, which is a mighty good thing! 6. Next we have the step 3 of the Nspa routine, I chose this simply because my skincare collection lacks an oil, and maybe this is the missing link in my routine. Mixing this in with the next product I am about to show you may be a good combination. I am quite sceptical of oils, because I have oily skin, it seems to go against my logic to apply more oil, but who knows, -it could work-. 7. Lastly in the Nspa routine you need to moisturise, as I have chosen a few oily of intensive treatments I thought I should counteract these with an oil-free moisturiser. Again it has radiance enhancing properties which I love, also I love the feeling of a gel rather than a liquid or milk. Due to it being a gel, it would work as a very good base for make-up if you do not like using primers. 8. And last up is the REN concentrate, I'm not actually sure what this is, whether it's and oil, moisturiser or a treatment. From the look of the bottle I'd think is had a pipette so perhaps its an oil? But I thought this would be good as it helps to minimise pores and discolouration is reduced, which leads again to a brighter complexion.